Click here for a listing of guides and outfitters rafting the Skykomish River. Just an hour from Seattle, the Skykomish River is considered the most challenging commercially run river in Washington State. The "Sky" as it's called by those that frequent this river, provides plenty of heart-pumping action for even the most seasoned rafting pro. While most of this river is class 3 to 3+, the highlight of the trip and the draw for adrenaline-seekers Boulder Drop, a class 4+ rapid. This rapid contains house-sized boulders and requires intricate and precise maneuvering to navigate this rapid and make it through successfully. While there are many other rivers in the state where rafters wear helmets for safety, this is the only one that the State of Washington steps in and requires helmets by law. 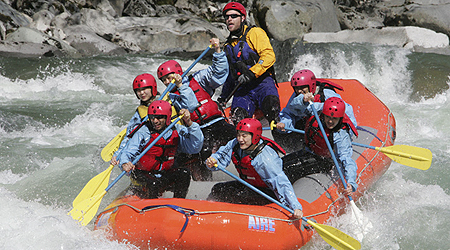 main rafting season for the Skykomish River is April through July. Most commercial trips start in the little town of Index and cover 7 to 10 miles. Class 3 rapids scattered throughout the first half of the trip such as Bridge Rapids and Anderson Hole lead up to Boulder Drop. Rafters pull over on the right side of the river to scout this rapid and prepare for the challenge. Once through Boulder Drop, a stretch of almost continuous class 3+ rapids keep the adrenaline pumping with The Ledge, Marbleshoot, Lunch Hole, and Aquagasm. The remainder of the trip is filled with class 2 and three rapids. This slightly calmer section gives rafters a chance to notice in the awesome scenery, with Mt. Index and Mt. Persis in the distance and aqua green colored waters all around. Most trips end in a conveniently calm area of the river called Big Eddie. *The river description above courtesy of Blue Sky Outfitters.